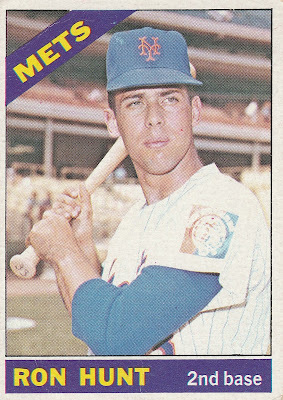 As I said at the top of my multi-blog checklist post, there were over 880 players who played from 1966-1970. I liked many of those players and followed their on-field exploits. Some others I was ambivalent to, either because they were non-descript or that they played for (usually American league) teams I didn’t follow. 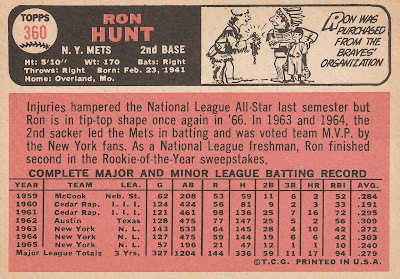 By all accounts, Hunt was a decent player. 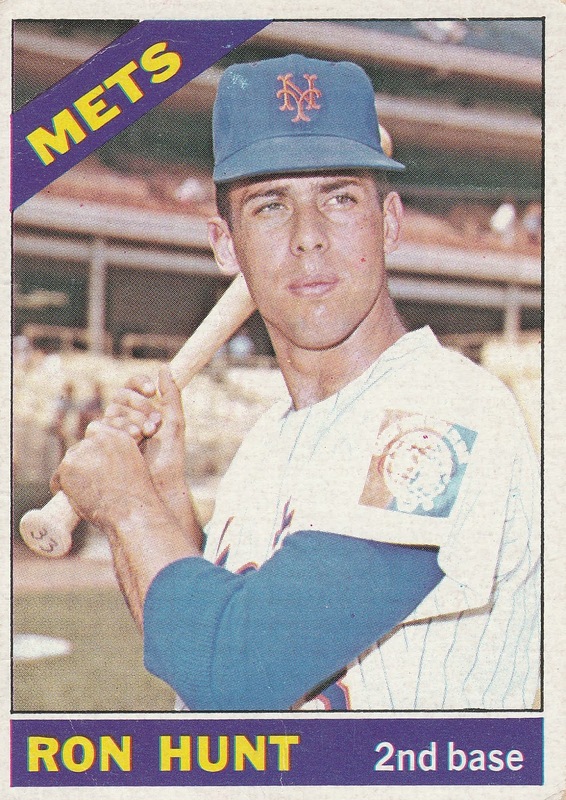 He was the runner-up for the 1963 Rookie of the Year award, and by virtue of his All-Star selections in 1964 and 1966 was probably the Mets' best player in their early years. 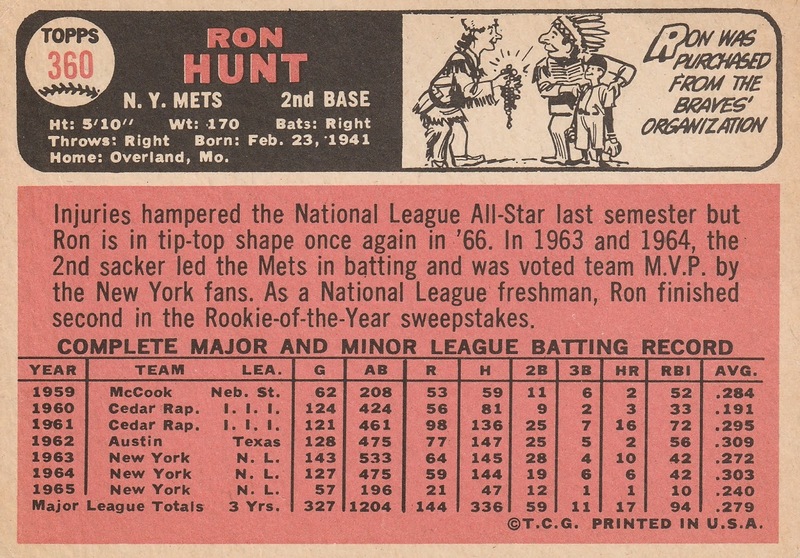 But something happened to Ron Hunt once he got to the Giants in 1968. 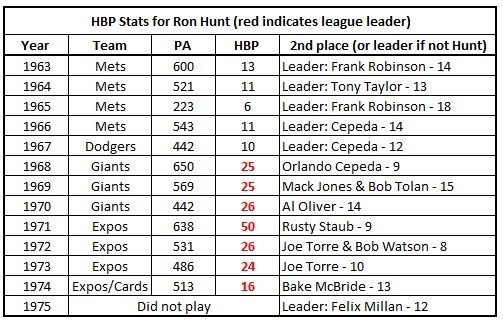 Always among the league leaders in HBP (except for 1965 when he missed many games), in '68 he started a streak of leading the league for 7 years, often more than doubling the total of the second-place guy. 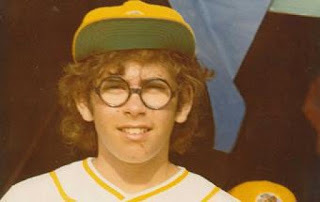 In 1971 he was hit FIFTY times! The next highest total belonged to Rusty Staub, all the way down at 9. 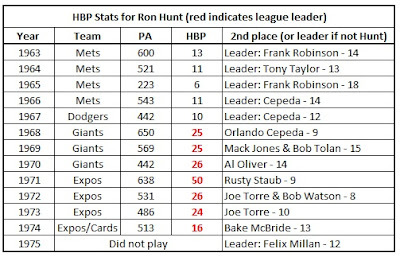 What, NL pitchers were only wild when Hunt came to the plate? No, this joker found a way to get on base without having to hit. He's like that kid in "The Bad News Bears" that coach Walter Matthau orders to step into the pitch to get hit, because he can't hit but they need a baserunner to allow the next batter (their best hitter) to get to the plate. On second thought, I have more respect for that kid, because at least he didn't want to get hit on purpose. The rules state that the batter needs to make an attempt to get out of the way. I'm just surprised that the umpires allowed this travesty to go on year after year, especially when he made it so obvious in 1971. Ron Hunt, you have earned this blogger's Top Chump award. Boy, that cartoon is kinda racist, isn't it?